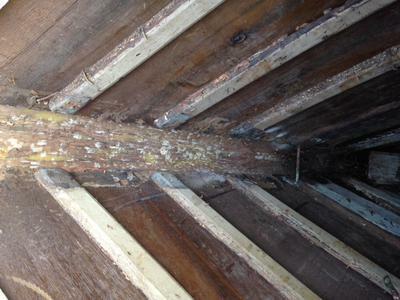 I have a 43' ply over timber Tripconny Bay Cruiser which we have fibreglassed over, only to find the lower part of Stem Post is rotten and we have had to remove the entire post. Does anyone have an ideas on how we could replace it from the inside without the need to cut away the plywood and glass (as it has just been painted). I would think it would be a 7'+ piece of timber with about 7 stringers joining in at the bow. A few of these were bolted through the stem. We were thinking of bolting the stem in and epoxying it in and fibreglassing over it from the inside. Take a picture and forward it to West Systems Epoxy, with your question and the people there will help you. Or, look for their book online " wooden boat repair and restoration" it's online for free. Just wondering if it might be easier to get the shape and dimensions right by laminating the new stem in situ. By laminating you could then make the stem, in effect, a one-piece structure rather the several pieces bolted together. You’ll still want some fastenings going through to it from the outside but at least these will just need holes easy to repaint.